There has been such a positive response to running another scrap swap so here it is!!! If you are participating in the scrappy cabin challenge and need some more variety for your blocks or if you just want to spice up your scrap collection for another project then join up. We had so much fun last year and I know that a lot of fabulous email pen-pal friendships were formed. So lets make sure we have a lot of fun once again! Here is a photo of my fabulous (and very neat) package I recieved last year from my swap partner Net! If you look at my scrappy cabin quilt so far you will see plenty of these pieces of fabric added in with my own! . 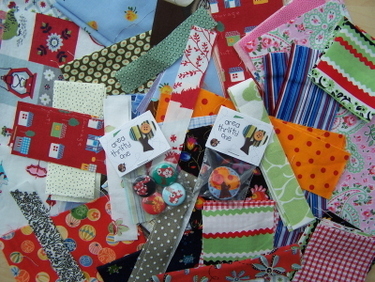 For this swap you will need to send a minimum of 250g (half a pound) of scraps suitable to be used for the Scrappy Cabin Challenge to send to your partner (All 100% cotton or linen patchwork fabrics please). If you are interested in participating in this swap please leave a comment on this post by the 15th of March to let us know. We will then collate the interested parties and send you a swap partner via email. It will be up to you to make contact and swap postal addresses with your swap partner. Of course this swap is open internationally and it is likely that you will need to post overseas depending on the partner you are given. I want to play! I love swaps! Haven't done a swap for a while so count me in! Look forward to it. How exciting...please count me in! I would love to join this. I've been saving my scraps wondering what I'd do with them! I'm not a member of the scrappy cabin challenge but I would like to swap for some great fabrics. I've got some good ones too! Please count me in too! I am loving my scrappy cabin blocks. I started about 4 weeks ago and it is heaps of fun. Please count me in this swap. I have so much fabric I would love to share with someone. And also receive perhaps some I do not have before. How big or small :) is the scraps going to be. Are there some rules about the size. Would love to be in the swap and challenge!